Are You Smarter Than Your Boss? 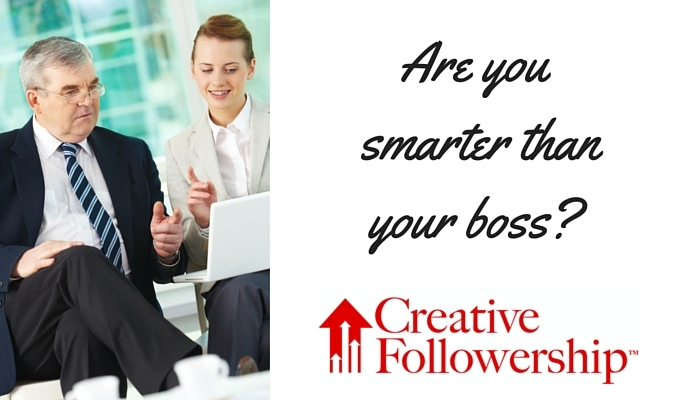 Do you think you are smarter than your boss? If you are convinced you are smarter than your boss, what should you do? In these situations, I do not give advice, but I ask questions, many questions. My thoughts go back to a personal experience that happened many decades ago. During my twenties, I was a salesman for a food service equipment dealer. My boss never seemed satisfied with me. Yet, he was always expressing how pleased he was with his two favorite salesmen. I was outperforming both of them. In sales, I consistently ranked with the top performers. Even though one of the youngest salesmen, I was the only one capable of designing, selling and installing the equipment for a complete food service operation. In fact, I had designed kitchens for more of the local high visibility name restaurants than anyone at any of the food service equipment dealers in our market area. Confrontations with my boss were a regular occurrence. It seemed that I seldom pleased him no matter how productive my performance. If my conflict with the boss was not because of my sales performance, it had to be something else. I thought maybe it could be lifestyle since mine was very different from the two men he favored most, yet, I could not see any substantial similarity in the life-style of those two men. Their backgrounds could not have been more different. One was aristocratic and sophisticated, and the other was redneck and rough. Our boss was not like either of them. He was competent, socially active and respected in the local business community. None of we three salesmen had, the same type of connections the boss did, in fact, none of us traveled in the same circles at all. All four of us had a different lifestyle; whatever caused the boss to favor the other two men must not have been a lifestyle issue. Why did I not receive the favor and recognition of the other two salesmen? Then, one day it dawned on me. How could I have been so dumb for so long? Those other two men did everything exactly the way the boss liked it done! Anything he asked they would do. The boss didn’t even have to ask. Whatever he suggested they would immediately do, exactly the way he liked it done. I had rediscovered another Principle of Creative Followership. Even though I had known this principle, I had not been actively using it. Not using it had cost me my boss’s favor and handicapped my advancement within the company. As I began to apply this Principle and do it the way the boss liked it done, my status with my boss improved amazingly! Unfortunately, this boss and I had some fundamental differences in our ethics and attitudes about how customers should be treated and business should be conducted. He asked his employees to do things that I was not willing to do. To be successful in my relationship with my boss, I now knew that I must be willing to do it the way the boss liked it done. In this situation, there were too many times when I could not do that. My Choice? Do it the way the boss likes it done or choose a new boss. I decided that “my way or the highway” was not a boss exclusive slogan. I was not willing to do it the way the boss wanted it done. I used the slogan myself, since I was not willing to do it his way, I chose the highway, and fired my boss. Of course, I did choose a new boss before I fired the one I was leaving. Great! As always. Thank you. We are somewhat obligated to do it the bosses way when we accept employment with them. But as you have said, if you feel the bosses way is going nowhere, is not helping to advance the business, and most importantly not honoring the guest that give the business a reason for being in the first place, then you can fire your boss and be highly selective when choosing your next boss! Another situation that must be considered is this. Are you willing to stick with a boss with asks you to do something illegal or immoral? How about the boss who asks you to lie? I have had bosses that asked me to do all of those. Many asked me to lie.